Persistence Market Research delivers yet another unbiased, comprehensive and insightful report titled ‘Medical Image Analysis Software Market: Global Industry Analysis (2012-2016) and Forecast (2017-2022)’. In this report, the global medical image analysis software market is explored in great detail, and the market dynamics of the global medical image analysis software market has been covered comprehensively, explaining to the report readers the drivers, restraints and trends operating in this highly competitive market. Also, analysis of the data over different parameters has been done in order to arrive at market numbers concerning the global medical image analysis software market. Besides, competition landscape of the global medical image analysis software market is also covered in this report, giving information about the key companies operating in the global medical image analysis software market. In the first part of the report, the executive summary and the introduction are given. The executive summary gives a summary of the global medical image analysis software market and gives the pertinent market numbers that are most significant, which include the historical CAGR growth from 2012 till 2016 and the forecasted CAGR from the year 2017 till the end of the forecast period in the year 2022. Information about lucrative markets from the point of view of leading revenue share and highest CAGR are also given in the executive summary. In the introduction section, the medical image analysis software market is defined in detail so that the report readers are clear about the scope of this market. The next section of the report gives information on the key dynamics of the medical image analysis software market. Key points covered in this section include the global economy, fiscal stimulus and bottom line of enterprises. In the subsequent section of the report, information is given on the cost structure analysis and pricing analysis of the global medical image analysis software market. An analysis on the market presence of key participants (intensity map) is also offered in this section. The next part of the report consists of the global medical image analysis software market analysis and forecast by product type, end user, modality, imaging type and region. This section of the report contains important market numbers in the form of year-on-year growth comparison, market share comparison and revenue comparison. The global medical image analysis software market is also analyzed across key regions- North America, Latin America, Europe, Japan, APEJ and MEA. The last section of the report contains the competition landscape, where leading market players operating in the global medical image analysis software market are profiled in detail. This information is in the form of company overview, product overview, key financials and key developments pertaining to that particular company. The competition landscape also features the SWOT analysis of the selected companies, which gives the report readers information about the strengths, weaknesses, opportunities and the threats that such companies operating in the global medical image analysis software market are facing. The competition landscape is an invaluable part of the report as it contains all the necessary information to study the leading companies operating in the global medical image analysis software market and how they implement their strategies and vision to stay in the pole position in this highly competitive market. 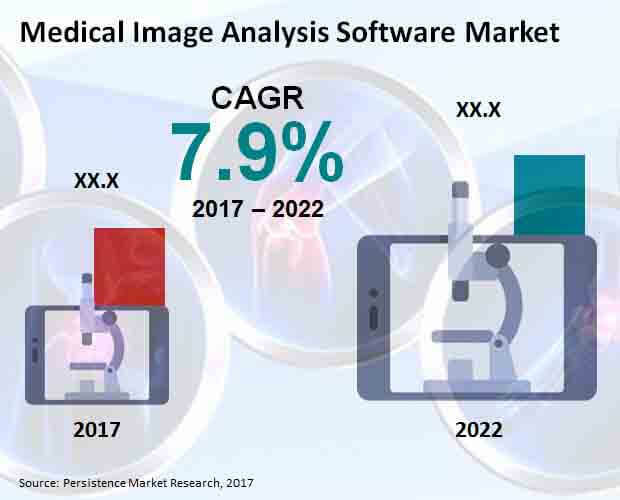 Persistence Market Research leverages a proven and tested research methodology to determine the revenue estimations of the global medical image analysis software market. In-depth secondary research is used to arrive at the overall market size and top industry players. A list of industry players (manufacturers), distributors, retailers, and industry experts is developed along with a comprehensive discussion guide for detailed and exhaustive primary interviews. Data thus obtained is validated using the triangulation method, where primary and secondary research along with Persistence Market Research analysis contribute to the final data. This data is then scrutinized using advanced tools to glean pertinent insights into the global medical image analysis software market. Since the incidences of chronic diseases are increasing all over the globe the urgency to use medical image analysis software is on a rise, which is driving the growth of medical image analysis software market. In addition, the trend of using electronic health records to store, distribute and manage patient health information in the form of medical images is also boosting the medical image analysis software market. Also, because of the fact that there is a continuous improvement in medical technology such as computer aided diagnosis, this opens up vast opportunities for the use of new and enhanced medical image software tools aiding in the treatment of a wide variety of diseases like cancer. Thus, there is a great demand for efficient treatment procedures that use such kind of software, leading to growth in medical image analysis software. The advantages of using such type of software are in the form of enhanced image quality, high resolution of images and multi-modal imaging platforms which are preferred by physicians. Also, by using such software for medical purposes, it facilitates the sharing of medical image records among doctors and hospitals, thereby reducing the time of diagnosis and aiding in the decision making process. These are the factors driving the global medical image analysis software market. In the medical image analysis, the health related problems are analysed with the aid of digital image processing technique and various imaging modalities. Such type of medical image analysis software is an important part of diagnostic machines and it is helpful in enhancing and identifying features of an image. This software is for the purpose of training, storing, viewing and sharing medical data. Medical image analysis software is utilized to increase the effectiveness and efficiency of medical treatment. According to the assessment of Persistence Market Research, the global medical image analysis software market is forecasted to reach a figure of about US$ 3,800 Mn in 2022 and is poised to exhibit a robust CAGR in the period of assessment. The market in North America is set to dominate the global medical image analysis software market in terms of value and this trend is projected to sustain itself throughout the assessment period. North America medical image analysis software market is the most attractive market, growing at a robust CAGR over the forecast period. According to the projections of Persistence Market Research, the integrated software segment is expected to reach a value of about US$ 1,430 Mn in the year 2022. This signifies a robust CAGR during the forecast period of 2017-2022. The integrated software segment is anticipated to account for more than one-third of the revenue share of the product type segment by the end of the year 2017 and is expected to lose in market share by 2022 over 2017. According to the assessment of Persistence Market Research, the hospitals segment is poised to touch a figure of about US$ 1,800 Mn in the year 2022. This signifies a CAGR of 7.8% during the assessment period from 2017 till the year 2022. The hospitals segment is estimated to account for nearly half of the revenue share of the end-user segment by the end of the year 2017 and is projected to lose market share by 2022 over 2017. The report also profiles companies that are expected to remain active in the expansion of global medical image analysis software market through 2022, which include AGFA Healthcare, AQUILAB, Carestream Health, Inc., Esaote SpA, GE Healthcare Inc., Siemens Healthineers, Sciencesoft USA Corporation, Philips Healthcare, Toshiba Medical Systems Corporation, Mirada Medical Limited, Merge Healthcare Inc. and Analogic Corporation.